This page explains how to configure controllers in Dolphin, assuming the controller is connected and working with your system. If you need help, or want game-specific configurations, see the forums. To open and manage the controller settings for Dolphin, from the Dolphin's main window, navigate to Options -> Controller Settings, or simply click the "Controllers" button. The main controller configuration window will appear, as seen in the screenshot below. In the first half, you can configure or disable the emulated GameCube controller ports. The GameCube controllers themselves are referred to as "Standard Controller" in the dropdown menu. The controller order on the PC does not have to equal to GameCube controller port order. They will be handled entirely in the GameCube Controller Configuration window. It is within each port's own "Configure" button. In the second half, you have options to use real, emulated Wii Remotes, or hybrid of two in the same slot. The Wii Remotes are referred to as "Wiimotes" in Dolphin settings. Select "Real Wiimote" in the dropdown for a Wiimote slot to use a real-world Wii Remote connected to your PC via bluetooth for that slot. Dolphin supports up to four Wii Remotes at once, along with any peripherals you have attached to them. The Balance Board is in the fifth slot in Wiimote settings and it is meant to enable with a real-world Balance Board. After you select what you want to use, check in the section(s) below for additional configuration. To use the actual GameCube Controllers using an Official GameCube Controller Adapter for Wii U (and its clones), see How to use the Official GameCube Controller Adapter for Wii U in Dolphin. It does not require any button configuration. That does not apply to the adapters that behave as generic controllers and need to be configured (see below). After setting any one of the emulated GameCube ports, proceed to the "Configure" button for each. One left unconfigured will be considered dummy "plugged in" during the game emulation. Choose any device that is connected to your PC in the Device dropdown, and set the buttons and axes to your liking. Left click a slot to detect input, then press a button/key or axes on your selected device to save it to that slot. Middle click a slot to clear it of inputs. Right click a slot to show more input options. See Input Syntax for documentation and examples. If you controller supports it, Rumble will allow your controller to experience the GameCube controller's rumble functionality. 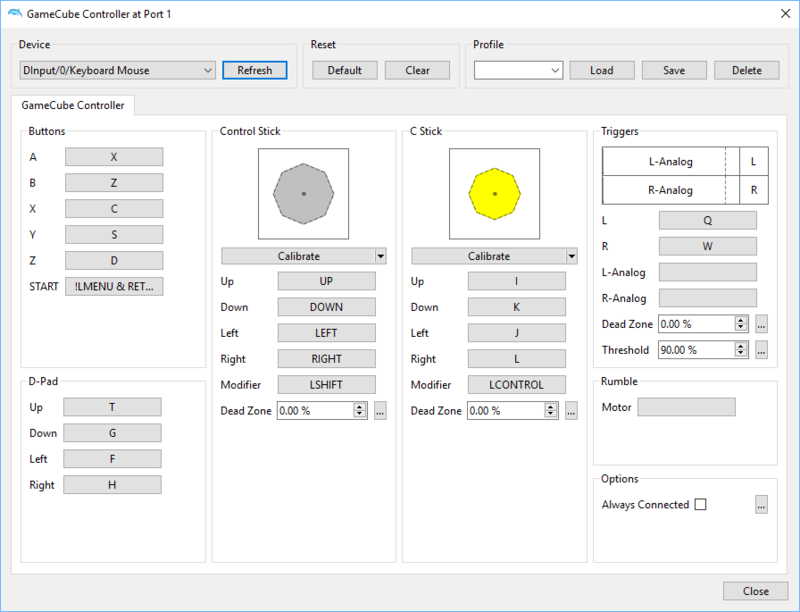 Within the rumble configuration window, click on the motor pattern you wish to use (sine, cosine, etc), and press "Select" to apply it. If you wish to add a second pattern, click another pattern and press "| OR". Hit "OK" to accept the changes and exit the window. Background Input lets you use the controller or keyboard even if Dolphin isn't in focus. This option will enable or disable symmetrically with Background Input in Wii Remote settings. This option has been moved to the main configuring controller window as of 5.0-3019. With Iterative Input checked, it will turn the configuration window into sequence mode (I.E. once you click on a slot to set a button/key for it, it will start a sequence). As soon as you press a input on your device and it gets assigned, it will jump to the next slot for you to assign another input to, and it will keep going until the sequence is done. Radius limits the radius of the joystick input. Since the GameCube controller does not use 100% of its radius, a radius of 70-75 is appropriate for most controllers. Those using an unofficial GameCube adapter should set the radius to 100. Profile allows you to save/load input configs. After setting up everything that you want, click "OK" and the changes will save. NOTE: If the controller is significantly off center in Dolphin but nowhere else, check all controller axis to see if one has a "+-" on it. This is not supposed to happen and is the source of your bug. To connect a Wii Remote, press "Refresh" then press the 1 + 2 buttons on your Wii Remote simultaneously (Sync button for -TR models). Continuous Scanning allows you to connect a Wii Remote without having to open the Wiimote window and press refresh every time. As long as a game is running or the Wiimote configuration window is up, just press 1 + 2 or the sync button on your Wii Remote simultaneously and it will connect. After several minutes of inactivity, Wii titles will attempt to disconnect the Wii Remote. The Wii Remote will remain on and connected to Dolphin, but the game will believe it is disconnected. To "reconnect" the Wii Remote, go to Tools -> Connect Wiimotes -> Connect Wiimote # or use a hotkey corresponding to it (example - the Windows default for Wiimote 1 is Alt-F5), or simply press a button on the Wiimote. Dolphin does not automatically turn off Wii Remotes as the Wii will (except on Linux). Remember to turn off controllers on your own to save battery power, simply by holding the power button on Wii Remote for a second as you would to turn off the Wii. It will also tell Dolphin that it's disconnected instead of stopping the game emulation. Wii Remotes use the Bluetooth interface, make sure your PC supports Bluetooth. 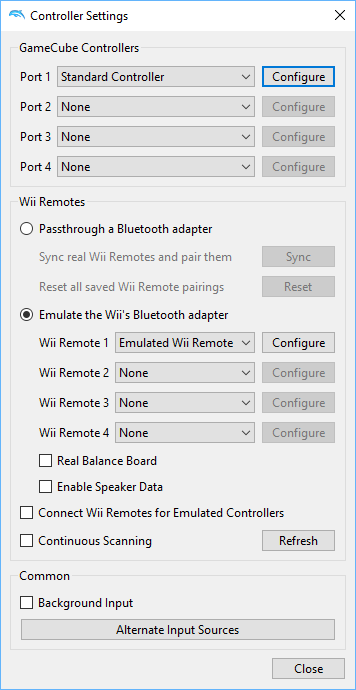 Do not pair the Wii Remote to your computer through its native Bluetooth settings. The operating system may interfere with Dolphin's ability to connect with the Wii Remote. In addition, Wii Remote connectivity will only work if one of the Wiimote slots is set to Real Wiimote or Hybrid Wiimote and it's not claimed by another Wii Remote. If the remote does not seem to want to connect, make sure that any real Wiis in proximity are switched off for the duration of the pairing process. RVL-CNT-01-TR Wii Remote Pluses may need extra configuration for older versions of Windows, see the Wii Remote Plus (RVL-CNT-01-TR) Connection Guide. The configuration window for emulated Wii Remote works in the same way as the GameCube controller settings. Extension Allows you to add an emulated Nunchuk, Guitar, or other Wii Remote peripheral. Select the extension you want to emulate in the dropdown, and press configure to open a window with slots just like the Emulated Wiimote window. Select buttons and axes as you wish, and press OK to save. Background Input lets you use the controller or keyboard even if Dolphin isn't in focus. This option will enable or disable symmetrically with Background Input in GameCube Controller settings. This option has been moved to the main configuring controller window as of 5.0-3019. Sideways Wiimote changes the emulated Wii Remote controls to allow you to play games as though the Wii Remote is sideways, without actually changing your controls. It is useful for games such as New Super Mario Bros. Wii that are designed for it. Upright Wiimote alters the base swinging and tilting orientation of the emulated wiimote to the upright position. Speaker Pan allows you to shift the emulated Wii Remote audio to the left or the right on your system speakers, if Enable Speaker Data is checked. -127 is left, 0 is centered, and +127 is right. If you controller supports it, Rumble will allow your controller to experience the Wii Remote's rumble functionality. 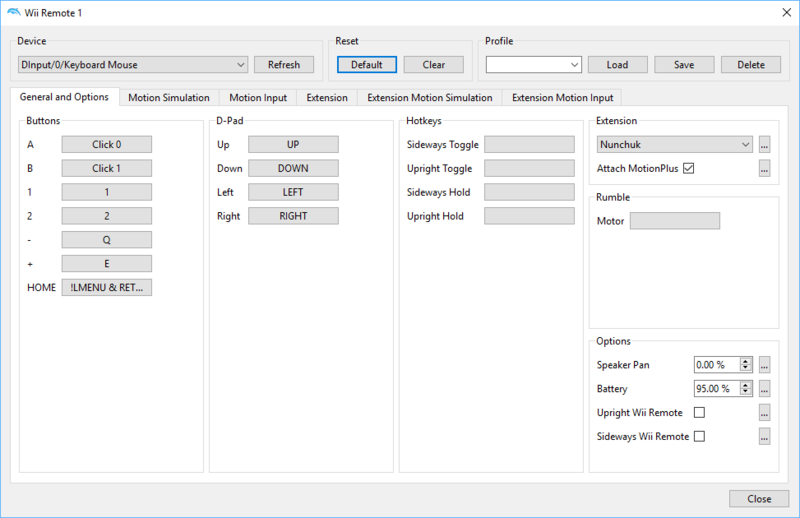 Within the rumble configuration window, click on the motor pattern you wish to use (sine, cosine, etc), and press "Select" to apply it. If you wish to add a second pattern, click another pattern and press "| OR". Hit "OK" to accept the changes and exit the window. These settings apply to both Emulated and Real Wiimotes. Sensor Bar Position, IR Sensitivity, Speaker Volume, and Wiimote Motor are duplicates of Wii settings. They do exactly what they say they do, and work exactly like the same settings on the Wii itself. Enable Speaker Data controls whether the Wii Remote speaker can produce sound. When using a real Wii Remote, the audio will come out of the Wii Remotes' speakers; with emulated Wii Remotes, it will come out of the system speakers. Some games, like Metroid Prime 3, have lag issues when Enable Speaker Data is enabled on some systems. Dolphin has preloaded user-configurable hotkeys only found under Options > Hotkey Settings. This has great use for Hotkey and Tool-Assisted Speedrun users, and it is required for Free Look (if enabled under Utility section in Configure... > Graphics Settings > "Advanced" tab) and a way to exit Fullscreen. Background Input lets you use the controller or keyboard even if Dolphin isn't in focus. This option will enable or disable symmetrically with Background Input in GameCube Controller and Wii Remote settings. There is no way to map hotkeys on the native controllers.